Refresh Yourself. True Stories of Struggle, Strife, And Success. It all began with a wadded up scrap of paper that languished at the bottom of her purse, lost among the loose change and old gum wrappers. Gayle was working as a nurse administrator, when a salesman slipped her a note with a phone number, This is someone you should meet. Gayle read the name on the note: Rita Snider. Yeah, sure, I ll get right on it, she thought, dropping it into her purse. There it sat - for a year. One day, on impulse, Gayle fished out the note and called. As soon as she d said hello, Rita replied, Honey, I ve been waiting for your call. A few days later, Gayle visited with Rita, and listened to the remarkable story of her battle with breast cancer. Diagnosed at age 36, Rita began chemotherapy and lost her hair nine times over. After a humiliating search for wigs and prosthesis, Rita declared Never again! Determined to help others, Rita opened a shop called The Lemonade Stand. A place to come and be refreshed , it was a safe and comfortable salon that provided women with everything they would need for their own fight with cancer. For seven years, she tirelessly helped hundreds of women fight the same battle that she was fighting. Rita surprised Gayle by saying, The Good Lord told me that if I hung on long enough, He d send someone to carry on. As soon as you walked in, I knew it was you. As amazing as it sounded, by the end of the day Gayle decided to quit her job and devote herself to The Lemonade Stand. Rita passed away later that year, but Gayle kept her dream alive for over a decade more. Those years were filled with financial struggles, heartaches, and challenges without end; but there were countless gifts and rewards as The Lemonade Stand went on to help over 10,000 clients. REFRESH YOURSELF TRUE STORIES OF STRUGGLE, STRIFE, AND SUCCESS It all began with a wadded up scrap of paper that languished at the bottom of her purse, lost among the loose change and old gum wrappers. Gayle was working as a nurse administrator, when a salesman slipped her a note with a phone number. “This is someone you should meet” Gayle read the name on the note: Rita Snider. Yeah, Sure, I'll get right on it, she thought, dropping it into her purse. There it sat --- for a year. One day, on impulse, Gayle fished out the note and called. As soon as she'd said hello, Rita replied, “honey I've been waiting for your call.” A few days later, Gayle visited with Rita, and listened to the remarkable story of her battle with breast cancer. Diagnosed at age 36, Rita began chemotherapy and lost her hair nine times over. After a humiliating search for wigs and a prosthesis, Rita declared “Never again!” Determined to help others, Rita opened a shop called the Lemonade Stand. “A place to come and be refreshed”. It was a safe and comfortable salon that provided women with everything they would need for their own fight with cancer. For seven years, she tirelessly helped hundreds of women fight the same battle that she was fighting. Rita surprised Gayle by saying “The Good Lord told me that if I hung on long enough, He'd send someone to carry on. As soon as you walked in, I knew it was you.” As amazing as it sounded, by the end of the day Gayle decided to quit her job and devote herself to The Lemonade Stand. Rita passed away later that year, but Gayle kept her dream alive for over a decade more. Those years were filled with financial struggles, heartaches, and challenges without end, but there were countless gifts and rewards as The Lemonade Stand went on to help over 10.000 clients. 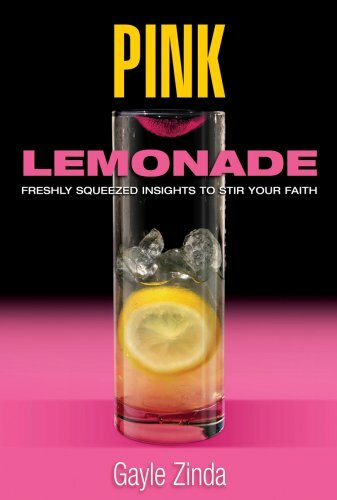 With her “glass half full” personality, GAYLE ZINDA has spend t her life taking lemons and making lemonade. She lives with her husband Michael, and two dogs, on a sparkling lake in Wisconsin, where they receive visits from six wonderful children and one beautiful grandson (so far). Besides writing, Gayle now travels as a motivational and inspirational speaker, keeping the story of The Lemonade Stand alive. She continues to deliver Rita's positive message of hope, hard work, and faith. GAYLE ZINDA has spent her life taking lemons and making lemonade. She lives with her husband Michael, and two dogs, on a sparkling lake in Wisconsin, where they receive visits from six wonderful children and one beautiful grandson (so far). Besides writing, Gayle now travels as a motivational and inspirational speaker, keeping the story of The Lemonade Stand alive. She continues to deliver Rita s positive message of hope, hard work, and faith.